The companies in the STRATACACHE family are pioneers in the digital signage industry and continue to lead the way in digital innovation and marketing technology, helping our customers convert or better serve their customers in wide-ranging industries including retail, QSR, grocery and finance. We create intelligent visual and audience engagement solutions found on 2.4 million+ digital screens in more than 100 countries and in 19 languages, giving us the world’s largest footprint. 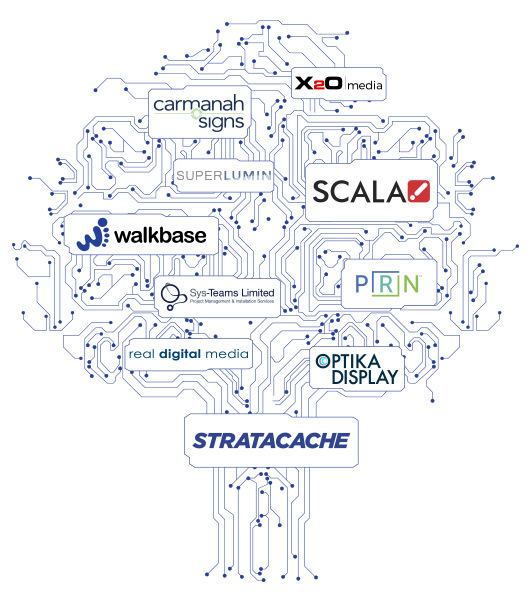 In total there are nine companies in the STRATACACHE family, each adding multiple complementary solutions to the full suite of STRATACACHE’s digital signage offering — enVu (interactive experiences for entertainment/hospitality); Carmanah Signs (lotto/gaming solutions at retail); SuperLumin (multimedia caching solutions); PRN (ad network monetization and POS retail solutions); Optika (highly advanced touchscreen displays) as well as content creation and management platform providers Scala, X2O Media and Real Digital Media. This uniquely positions STRATACACHE to deploy and support the full scope of a digital signage network — from content management to hardware and advanced analytics — on a global scale. To apply to our open positions, click below!